Steve Cook felt Bournemouth's desperation to win at Brighton & Hove Albion on Saturday was the difference as the Cherries ran out 5-0 victors. The win moved Bournemouth on to 41 points and Cook says they went into the game knowing a defeat could draw them back into the relegation battle. Cook began his career at Brighton and afterwards said: "I feel we were desperate to win today. We had to win, they might have wanted to win but that was the difference. We were ruthless. "We've been on the end of that this year where Burnley last week wanted it more than us it seemed. Today we were desperate to win and we did everything we could. Not many teams come here and score five goals because Brighton are usually very good and very solid at home. "It shows how big the win is because Brighton at home are one of the best. "Decisions throughout the game went our way. They didn't threaten our goal too much and that told as we won 5-0. "If results went against us today we could have been dragged back into the relegation fight but when we're brave on the ball and look to pass it, we showed how good a team we can be. "Now it's all about doing that more often and being more consistent." Cook played for the first time since early February after a groin injury and admitted he was targeting the Brighton game: "Without a doubt, I've had this game in my mind. To play any game at the end of the season was the aim because I got told I wouldn't play again this season. "To come here I've timed it really well considering we won 5-0, so it's a nice feeling and hopefully we can continue to do that." 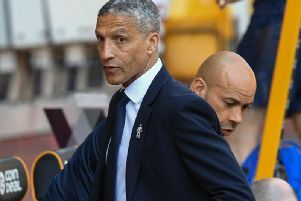 Cook added he could not defend Brighton winger Anthony Knockaert after his red card for a foul on Adam Smith at 2-0. He said: "It was nasty. I know him quite well and it's unlike him. I can't really defend him as it was a real bad tackle. "Smudger was lucky to come out and continue the game. I don't know what was going through his head, maybe a bit of frustration but it wasn't great.